This location is subject to a bandit toll, which should be documented. 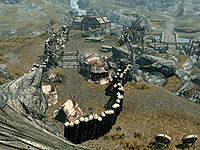 Robber's Gorge is a bandit camp spanning the road from Rorikstead to Dragon Bridge. While the most direct path is through the road way entrance and in through the camp gate, a covert approach from the southwestern side will allow access to the camp and permit an archer to hit the guard sentries controlling the trap levers from the overpass bridge. Robber's Gorge: Find the treasure of Robber's Gorge. One bandit guards the western front. One bandit guards the northern rear entrance. The remaining three bandits are stationed in the main area of the fort. The Bandit Chief is positioned inside the house. There are three bear traps at the western entrance. Three falling rock traps are on the side of the path and can be triggered by levers (one on the west side of the bridge, two on the east) at the lookout towers above. The Bandit Chief carries a Key to Robber's Cove. In the house where the Bandit Chief is found, there is a copy of the Archery skill book The Black Arrow, v2 on the table, another Key to Robber's Cove, and valuable leveled loot. There is a bedroll in the eastern room of the house. There are no enemies in this zone. Immediately in front of the player on the table sits the Bandit Leader's Journal. There seems to be leveled loot near the table. The treasure chest to the left is locked at an Expert level, but can be unlocked with the Robber's Cove Key. It will be open and empty if you are not on a related quest. To the right, a skeleton's hand can be seen floating on the surface of the water. Below it lies the rest of the skeleton, as well as a coin purse. In the northeastern corner of the cove, a locked (Adept-level) chest sits underwater with loot inside, next to armor and weapons. The Bandit Leader's Journal in the Cove recounts the Bandit Chief's mutinous strife with his crew, and his plans of stashing away gold, eventually accruing enough to run away before he is murdered by his own people. He writes that he has moved his stash, hiding it on "the island to the south, by the old tree stump." The player can proceed out of the cove exit to the south and head directly south towards the waterfall; the chest will indeed be there on the south side of the aforementioned tree stump. The chest is locked (Master-level) but can be unlocked with the Robber's Cove Key. To get out of the water without leaving the cave, swim up against the boat and jump. This will get you onto the low rocks beside the dock. The only other way out of the water takes you out of the cave, so it is advisable to leave submerged loot until the rest of the loot in the cave has been collected if you have trouble with the boat trick. The bandits may stop you and demand that you pay a toll of 100 gold. The cove's interior cell has the apostrophe after the "s" (Robbers'), whereas the map name, related faction, and the location's key use "Robber's". This issue has been addressed by version 1.3.2 of the Unofficial Skyrim Patch; the interior cell has been renamed to Robber's Cove.